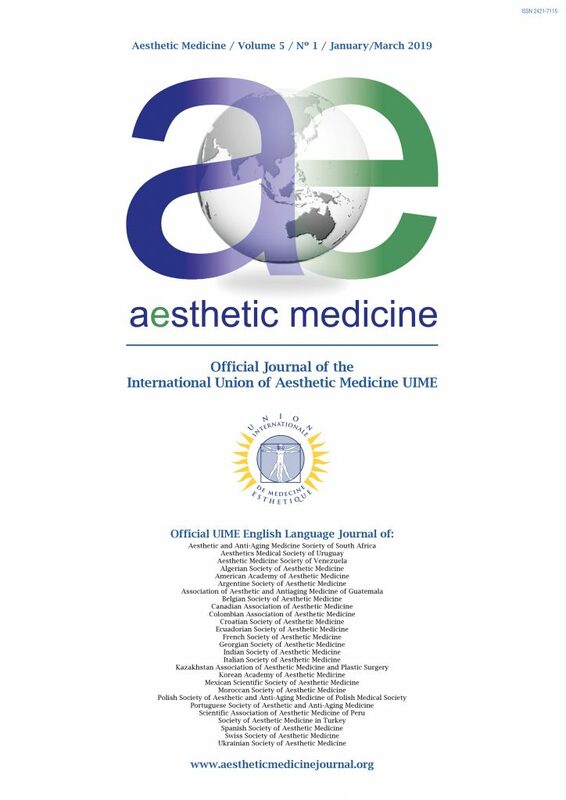 Aesthetic Medicine is a multidisciplinary Journal with the aim of informing readers about the most important developments in the field of Aesthetic Medicine. Manuscripts must be written in English, and authors are urged to aim for clarity, brevity, and accuracy of information and language. All manuscripts must include a structured abstract. Authors whose first language is not English should have their manuscripts checked for grammar and stylistic accuracy by a native English speaker. Keywords up to six keywords should be listed and separated by a comma (please, verify keywords on MeSH). The manuscript must not exceed 4000 words and 50 references. This type of article uses Unstructured Abstract. It must not exceed 4000 words and includes figures and tables (max 15), legends, and up to 200 references. This type of article uses Unstructured Abstract. It must not exceed 2000 words and includes figures and tables (max 12), legends, and up to 100 references. This type of article uses Unstructured Abstract. It must not exceed 1500 words and includes figures and tables (max 6), legends, and up to 30 references. If potential conflicts of interest do exist, the authors should provide details (see below) for each affected author in a note in a separate DISCLOSURE section of the manuscript document text, before the list of references. Conflicts of Interest need to be explicitly defined before any manuscript can be considered for publication. References must be cited consecutively in the text as superscript numerals and listed on a separate sheet in numerical order at the end of the text. The references must be cited according to the AMERICAN MEDICAL ASSOCIATION (AMA) CITATION STYLE. For this reason, they must contain author’s surname and name initial, the original title of the article, the title of the journal (abbreviated and in italic), the year of publication, the number of the volume, the number of the first and last page. All images within the word file must be numbered progressively and accompanied by the corresponding captions, with precise references in the text. Moreover, the images should be sent separately and in HD (at least 300 Dpi, in TIFF or JPEG format). Graphs and charts are progressively numbered and accompanied by the corresponding captions, with precise references in the text. They must be sent separately, preferably in Excel format. It is necessary to give the authorization to reproduce already published materials or to use people portraits, in case they are recognizable. The Authors has full, exclusive and personal responsibility and respect for the rules protecting privacy, originality and content (text, images) of the articles. Photographs in which a person is identifiable must either have the face masked out, or be accompanied by written permission for publication from the individual in the photograph. Authors wishing to include figures, tables, or text passages that have already been published elsewhere are required to obtain permission from the copyright owner(s) for both the print and the online format and to include evidence that such permission has been granted when submitting their papers. Any material received without such evidence will be assumed to originate from the authors. Please be informed that we will not be able to refund any costs that may have occurred in order to receive these permissions from other publishers. Please be aware that some publishers do not grant electronic rights for free (an example is Thieme Publishers). In these cases we kindly ask you to use figures from other sources.